Written by Preston Lerner and Matt Stone and published by Motorbooks, this book rates Number One for everything that's wild, wacky, wonderful, wonky and just plain weird in the world of the automobile. Guaranteed to make you laugh out loud, here are 256 pages of breakneck speed, non-stop nuttiness--a kind of Trivial Pursuit for the car-crazed among us. The book contains 68 colour and 80 black & white unbelievable photos. Every tale is true and every story more astonishing than the last. Be stunned by the tale of a transvestite scam artist who promoted the Dale automobile. Did you know that American Motors had a Hornet that could fly? Oh, wait! Look out, air traffic controllers! Ford had a flying Pinto! 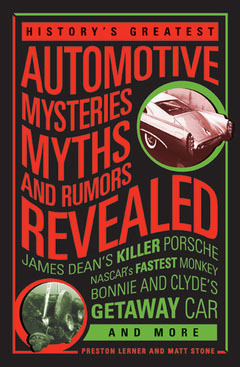 Gangsters, actors, criminals, and race car drivers have all put their personal touches on their beloved vehicles and added to the wealth of folklore gathered together in this wild romp through automotive history. Highly recommended as the ultimate washroom reader, it makes a terrific companion for long trips on VIA Rail, too.